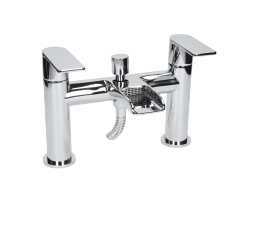 Save with our Architeckt Motala Basin and Bath Shower Mixer Waterfall Tap Set. Operate your bathroom taps with the flick of a finger and watch the enchanting waterfall’s descent. The sleek, ergonomic design of the Architeckt Motala Mixer Waterfall Tap Bath Shower Set means that turning on your tap, is easy and stunning. 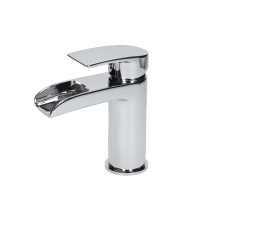 With the option to have a bath or a shower, at the flick of a switch, this is great value and design in one. Simply flick the diverter to shower in peace. The delectable waterfall feature sends a mesmerising cascade of water into your bath or basin when you turn on the taps. Motala’s quarter-turn ceramic disc technology makes light work of filling your bath. Watch as a lustrous cascade of water descends into your bath - which is ready for you in no time at all. Use the easy mixer tap function to get your perfect combination of hot and cold, then simply lie back and relax, or shower and go – whichever you prefer. Built to last, this stylish set of taps is made out of solid brass. With a stunning, streamlined chrome finish, rust is kept away. There are no drips or rubbing, with this range, your set is guaranteed to last. Compatible with all plumbing systems, every product in the Motala range comes with a five-year manufacturer’s guarantee.